Are the ‘assessed value’ and market value related? In short, the answer to this question is “no”. Disclaimer: this answer applies to metro Phoenix, Arizona in the year 2011, where I work as a full-time Realtor. If you’re reading this long after publication or from another location, please consult a professional in your area. In other words, I am a Realtor but I am not your Realtor… yet. Wanna hire me to be YOUR Realtor? Click here. Lots of buyers want to use the Maricopa County Tax Assessor’s “Assessed Value” to justify why they should be able to buy a particular house for less than the listing price. This is especially common among folks who are engineers, attorneys or other Type-A’s. Listen up, Type-A’s! I feel your pain. I understand your need to get your hands on hard data, statistics, charts, graphs, etc. Thing is, the market value of houses has to do with 1 thing, and only 1 thing: what are other buyers currently paying for other, similar homes? This home has 2,425 square feet built in 1995 with a pool in the backyard, and the lot backs up to mountain preserve. The home is currently listed for sale at $240,000. Notice that all 4 of these homes were on the market for less than 40 days before finding a buyer – the market’s moving pretty fast. One home has yet to close, and it’s included as a possible indication of where prices are headed. Look at the column titled “SP” for “selling price”. Comps on this home range from $235,000 to $276,500. In other words, other buyers have very recently paid between $235,000 and $276,500 for very similar homes in similar condition, located very close by. Therefore, the market value on this home is somewhere in the mid-$200,000s. If you make an offer of $147,500 you will be wasting your time. Thanks for reading; come back soon! Here it is, folks, the most expensive REO bank owned foreclosure home currently for sale in the metro Phoenix, Arizona MLS database. For a mere $18 million, this estate can be yours. Seven bedrooms and 10 bathrooms, and over 17,000 square feet of living space. The home boasts two swimming pools, a billiard room, 3 family rooms, a theater room with actual movie-house projection system and seats that move with the movie action. Garage space for 21 cars. Home has an exercise room and a piano room, 2 libraries, and it’s own solar electric generating station. And, proving that even the excessively wealthy have sense of humor, at the entrance to this home’s theater room, Zoltar from the movie Big. Today I thought I’d pull some numbers, charts & graphs for the Desert Ridge area, to see where the activity really is. Overall it looks like homes are selling at a brisk pace; 3.75 months’ inventory is generally considered a seller’s market. Sales are heaviest in the $100,000 - $300,000 range, accounting for 276 of the 404 total sales (68%). Listings are spread out a little more, although the $100,000 - $300,000 range still accounts for the largest share (62%). Combining the Sold and Active data to look at Months’ Inventory by Price Range, I was surprised to see a fairly consistent inventory, at least for the prices < $600,000. The market is just as hot between $400k - $600k as it is for homes < $200k, while it’s a little softer in the middle range of $200k - $400k. And forget about it once you get above $600k; the market deteriorates quickly. My guess is that the sub-$200k market is being driven by investors & distressed activity, and the $400k - $600k market is made up of owner-occupied and second-home buyers snapping up formerly million-dollar homes, while the traditional mid-range move-up market is the soft spot in the middle. Next time I’ll dig even deeper to see if my hunch is right. In the meantime, please give us a call if you want to see a particular neighborhood or have any other questions. Holy cow! The California legislation just passed a law preventing banks and other lenders from suing homeowners for unpaid mortgage balances after the lender agrees to a short sale. (hat tip, Kris Berg of the San Diego Castles blog). The way I read it, the new California law also prevents the lender(s) from requiring the homeowners to pay a lump-sum settlement at the short sale closing. [The California legislature just passed into law] Senate Bill 458, prohibiting a deficiency after a short sale for one-to-four residential units, regardless of whether the lender is a senior or junior lienholder. .... Both senior and junior lienholders cannot require a borrower to owe or pay for a deficiency in a short sale. This law also prohibits any deficiency judgment to be requested or rendered for senior or junior liens after a short sale of one-to-four residential units. Will it ever happen here, in metro Phoenix? Don't count on it. Politically, Arizona is far more "red" than California. Some years we're purple, but we've got a very, very long way to go until we're as blue as California. Note to Arizonans: Arizona does not have a law on the books yet that protect homeowners in these kinds of situations. In Arizona you can be sued by your 2nd lender for the unpaid 2nd mortgage balance, for up to several years after a short sale, even if the lender gave permission for the short sale! So what should you do if you're underwater, considering a short sale, and have a 2nd mortgage or equity credit line/loan? Call an attorney! Call or email me and I'll be happy to refer you to the attorneys who handled my short sale. Prices are down. Notice the average sales price and the average price per square foot are down 11-12% from this time last year, although both have been holding steady over the last 6 months, and have even shown a slight uptick in recent months. In addition, Days on Market is trending downward after hitting a high mark earlier this spring. Taken together, this tells me we’ve hit a market-clearing sweet spot for investors. The current prices allow investors to buy distressed homes, fix them up, and rent them out for enough money to generate acceptable profits. Good news in that prices shouldn’t fall any further; bad news in that prices can’t rise either – as soon as the numbers stop creating profits the investors will stop buying. Looks like we’re stuck in a holding pattern for the time being, but at least it’s a holding pattern that’s clearing vacant homes out of neighborhoods. A recent survey by home finance company Fannie Mae found that while only about 27% of homeowners would even consider walking away, that's up from 15% last year. 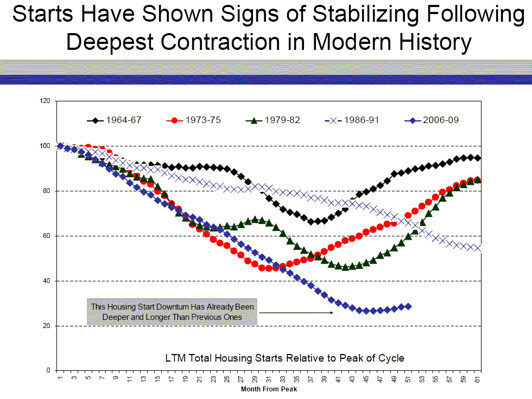 Just how bad is the new home building bust? Friend & colleague John Wake published this chart yesterday. We all know it’s bad, but this chart makes the point very clear..
click here to read the original article at Wall Street Journal dot com. To claim “The Great Recession – worst economic times since the Great Depression” a couple of years ago sounded like a bit of an embellishment to a lot of people; today I don’t think there’s any doubt. How many Realtors in Arizona? According to the Arizona Department of Real Estate, at this moment in time there are 39,682 people in Maricopa County with active real estate licenses. Renting? Food for thought here. Some thoughts I’ve had lately about being a renter in today’s real estate market. Landlords usually do a credit check and sometimes even a background check on prospective tenants. If I was a prospective tenant, I think I’d ask the landlord for a credit check on him/her in return. You probably don't need (and won't get) a credit check on your landlord, but some information is worth asking for. Why? Many, many landlords are renting their home because they couldn’t sell it. It’s possible that the rent paid by the tenant doesn’t cover the landlord’s mortgage. If I’m a tenant, I want to know that the landlord is covering that gap, and doing so comfortably. That way, I don’t get a Notice taped to “my” front door one day telling me I have to move out because the house is going to the foreclosure auctions. what is the fair thing to do if the A/C breaks in July? what is the fair thing to do if the water has to be shut off for a day? for two days? three days? is there a home warranty in place? if so, who pays for the service call fee when the home warranty is used to fix minor broken things around the house? how often does the landlord plan on coming over to inspect things? will s/he give notice before hand? If so, how much notice? Who’s supposed to change the A/C filters inside the house and how often? Does the landlord keep a key to the house while I’m living in it? I’m not sure there’s a standard, “right” answer to any of those questions. But – particularly me, as a woman living alone – I’d want to know if my landlord lived in town and kept a key to the house I was planning to live in. I’d probably want to know that too, if I was a parent with small children in the house. Many tenants work with Realtors to find their next rental home. If you’re looking to rent, I’d recommend it. Personally, Chris and I don’t usually handle rentals. But our broker Thompson’s Realty has a Realtor on-staff that handles rentals all the time, both landlord-side and tenant-side.